Maharishi Mahesh Yogi who earned global popularity on account of his transcendental meditation, reached his hometown Allahabad on Saturday for a grand cremation slated for Monday. A chartered flight carrying the body of the Maharishi from his spiritual base in the Netherlands reached Babatpur airport in Varanasi on Saturday morning, from where the body was carried in a flower-bedecked truck to Allahabad. After reaching Allahabad, the body was taken in a procession down the city streets to the ashram of well known Hindu cleric Swami Vasudevanand. Thousands of people turned up at the ashram to pay their last respects to the Maharishi. The otherwise wide streets of Allahabad remained clogged on account of the long motorcade procession that drew huge crowds along the sides to have a glimpse of the departed spiritual icon who had once been a 'guru' to The Beatles. Mahesh Yogi's body has been kept in a specially erected enclosure at the Vidyapeeth where it remained open to public on Sunday. According to the Maharishi's nephew Prakash Srivastava, the cremation will take place on the banks of the Ganga in the vicinity of the Vidyapeeth on Monday morning. 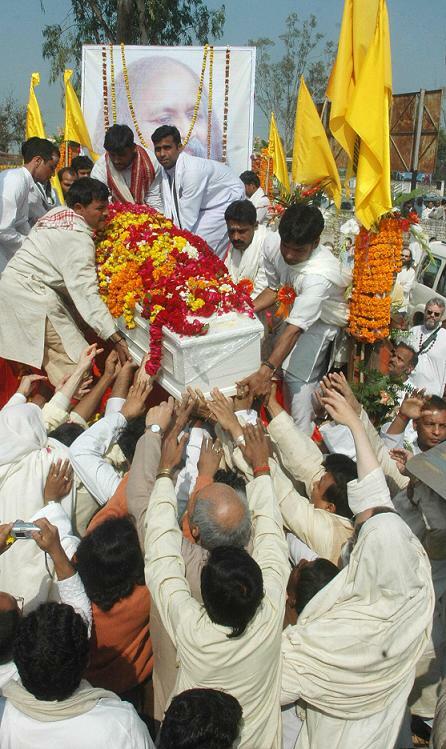 Image: Devotees of Maharishi Mahesh Yogi carry his coffin, which was flown from the Netherlands for the last rites in Allahabad on February 9.